Background: Physiological and Operative Severity Score for the Enumeration of Mortality and Morbidity (POSSUM) is a validated instrument used to predict morbidity. The aim of our study was to evaluate the performance of the POSSUM score system on predicting perioperative frailty and quality of life (QOL) in elderly surgical patients. 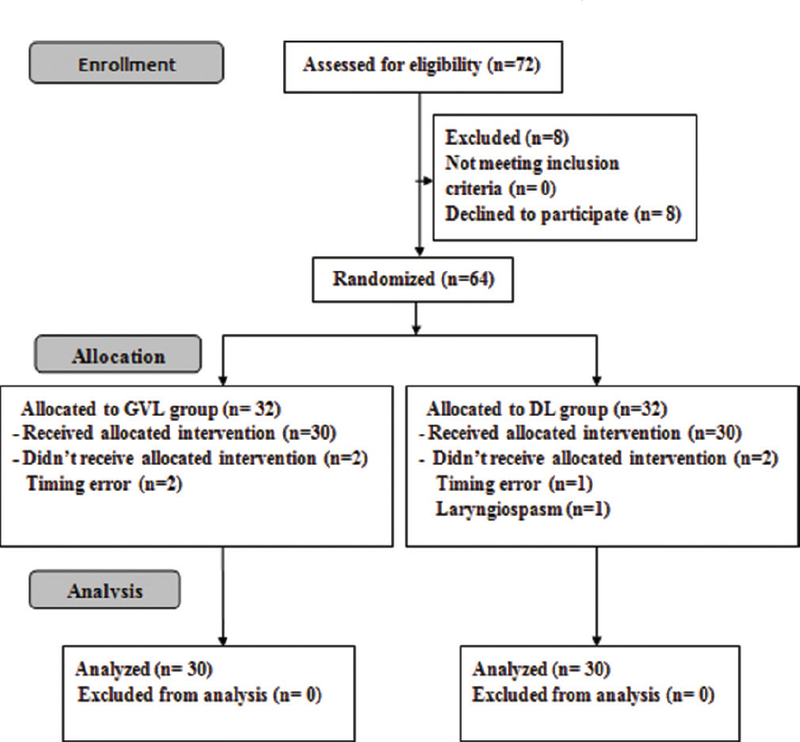 Patients and Methods: An observational prospective study was conducted during 3 months. POSSUM was used to determine operative morbidity risk. Patients with a POSSUM score ≥26 were considered as having a high POSSUM (PHP). WHODAS 2.0, EuroQOL-5 dimensions (EQ-5D), Charlson score, and the Clinical Frailty Scale were used to assess the QOL and frailty. Chi-square, Fisher's exact, or Mann–Whitney tests were used for comparisons. Results: Two hundred and thirty-five patients were included. Median age was 69 years; 58% were ASA I/II and 42% ASA III/IV. Frailty was present in 53 patients (23%). Median POSSUM score was 26. Patients PHP were older (median age 71 vs. 68, P = 0.008), more frequently ASA III/IV (P = 0.001), had higher median Charlson scores (7 vs. 5, P = 0.006) and were more frail (49% vs. 26%, P < 0.001). PHP presented more problems in EQ-5D dimensions preoperatively (mobility: 59% vs 41%, P = 0.008; care: 41% vs. 25%, P = 0.013; activity: 52% vs. 32%, P = 0.002; pain: 59% vs. 45%, P = 0.041) but not anxiety (P = 0.137). Three months after surgery, PHP patients presented more problems in mobility: 63% vs. 38%, P < 0.001; care: 48% vs. 31%, P = 0.009; activity: 58% vs. 44%, P = 0.036; pain 59% vs. 37%, P = 0.001 and anxiety: 54% vs. 50%, P = 0.025. Conclusions: Patients PHP were frailer and had worse perioperative QOL. Background: Whether intraoperative use of hydroxyethyl starch (HES) solutions is associated with postoperative acute kidney injury (AKI) continues to be researched. Urinary neutrophil gelatinase-associated lipocalin (NGAL) is validated for early detection of AKI. Previous studies are limited and use empirically predefined volumes of HES solutions with serum creatinine as marker for AKI. Materials and Methods: Adults scheduled for orthopedic surgery under general anesthesia with >200–300 mL blood loss expected were included; 40 were randomized to receive 6% HES 130/0.4 (tetrastarch) (group HES) or Ringer's lactate (group RL) boluses when stroke volume variation (SVV) >10% in supine or lateral position, or >14% in prone position. Incidence of early postoperative AKI using urinary NGAL (>100 ng/mL) was the primary outcome, and using derangement of serum creatinine was the secondary measure. Results: In 38 patients, intervention was completed, and incidence of AKI (postoperative urinary NGAL >100 ng/mL) among them was 0% in both groups. Patients with urinary NGAL >50 ng/mL were insignificantly higher for group RL versus group HES (6/19 vs. 4/19) (P = 0.461), as were those with incidence of AKI as per creatinine values (5/19 vs. 4/19) (P = 1.000). Group RL had significantly higher requirement of fluid (1211 ± 758 mL vs. 689 ± 394 mL) (P = 0.013) and lower cardiac index (P < 0.05) versus group HES. Conclusion: SVV-guided tetrastarch and Ringer's lactate do not result in postoperative AKI diagnosed by urinary NGAL >100 ng/mL; however, an insignificant trend for better renal functions as well as significantly more efficacious volume expansion and hemodynamic stability were seen with tetrastarch instead. Background: Hyperhidrosis is a functional disorder identified by excessive sweating. Its incidence is approximately 1% in any population. Bilateral endoscopic thoracic sympathectomy (BETS) intervention is the definitive treatment of choice for palmar and axillary hyperhidrosis. Aims and Objectives: The purpose of this study is to evaluate and compare the quality of life (QOL) and satisfaction rate of patients with upper limb hyperhidrosis before and after BETS surgery and the influence of compensatory hyperhidrosis (CH) on patients' QOL after surgery. Settings and Design: This study is a cross-sectional study designed to generate longitudinal data. Subjects and Methods: This study is a cross-sectional study designed to generate longitudinal data pre- and postbilateral BETS prospectively. This study was conducted in the surgery department of University Hospital in Riyadh, Saudi Arabia. Hundred patients with upper limb hyperhidrosis who underwent BETS from 2014 to 2017 were included. A modified and validated QOL questionnaire for hyperhidrosis was completed by the patients themselves in order to compare the QOL for patients both before and after BETS. Patients' satisfaction and the occurrence of CH were obtained postoperatively. Statistical Analysis Used: Data were analyzed using the SPSS® statistical package for social studies, version 22.0 (SPSS 22; IBM Corp., New York, NY, USA) for Windows®. Results: A total of 100 patients completed the questionnaire; 94% of patients had a positive QOL outcome after the surgery. The mean decrease in QOL scores was −42.0 points toward better QOL. The site of sweating had a significant effect on the patients' QOL before and after the surgery (P value < 0.001). Moreover, 76% of patients reported a high satisfaction rate. Conclusion: Primary hyperhidrosis can negatively impair patients' QOL in different domains. BETS showed to be an effective option for improving the QOL of patients and it provided both short- and long-term effectiveness in treating upper limb hyperhidrosis. CH did not interfere with the rate of patient satisfaction or their QOL postoperatively. Background: Naso/Orogastric tube (NOGT) misplacement can lead to significant complications. Therefore, the assessment of tube position is essential to ensure patient safety. Although radiography is considered the gold standard for determining NOGT location, new methods may be helpful in reducing repetitive radiation exposure, especially for neonates. 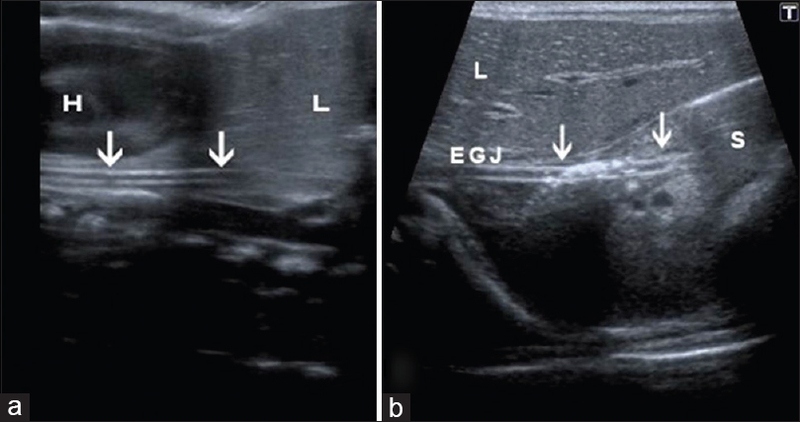 In this study, we sought to investigate if bedside ultrasonography (BUSG) can be used to verify NOGT placement in neonatal intensive care patients. Materials and Methods: Infants requiring NOGT placement were enrolled. After insertion of the NOGT, the location was first identified using BUSG and then confirmed using abdominal radiography for comparison. Results: The study cohort included 51 infants with an average gestational age of 34 ± 4.9 weeks. BUSG determined the NOGT location correctly with a sensitivity of 92.2%. The location of the NOGT could not be determined by BUSG in four neonates (7.8%). In one infant, the NOGT was positioned in the esophagus, as determined both by BUSG and radiography. Conclusion: BUSG is a promising diagnostic tool for determining NOGT location in neonates, thereby eliminating the need for abdominal radiography. Background and Objective: Anesthesiologists encounter difficulties during laryngoscopy and tracheal intubation of neonates with myelodysplasia. Tracheal intubation in lateral position in such cases deemed profitable but not easy because of the compromised laryngeal view. 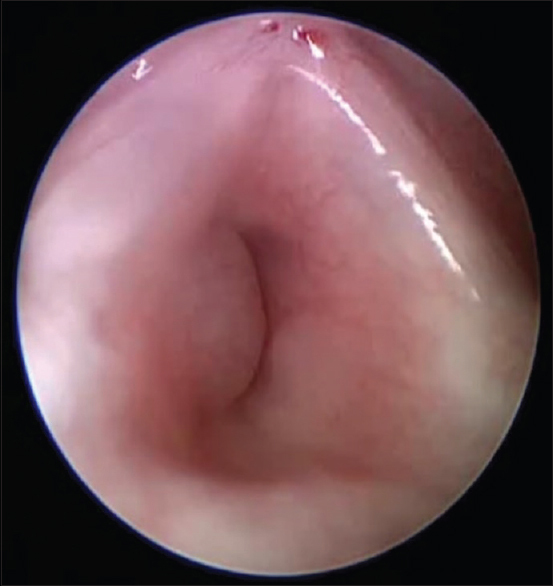 We compared GlideScope video laryngoscope (GVL) versus conventional Miller direct laryngoscope (DL) for tracheal intubation in laterally positioned neonates with myelodysplasia. 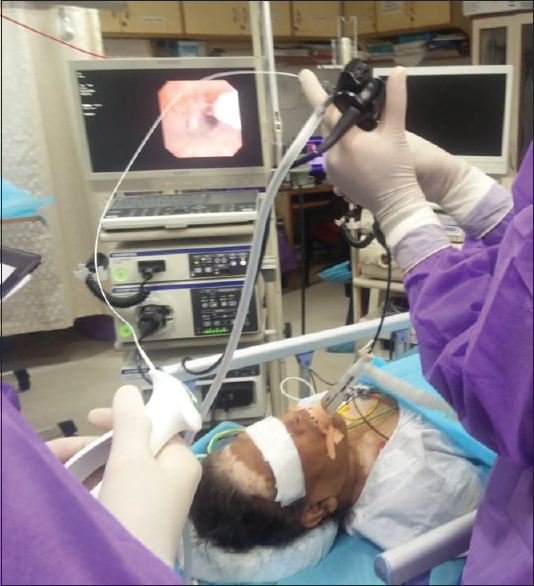 Materials and Methods: Sixty neonates scheduled for elective surgical repair of meningeocele or meningeomyelocele under general anesthesia were allocated randomly for endotracheal intubation using GVL or DL. Percentage of glottis opening (POGO) scores, time to best glottis view (TBGV), endotracheal tube passage time (TPT), intubation time (IT), intubation attempts, and overall success rate of intubation were recorded. Results: TBGV was significantly shorter in GVL group (median = 6.8 s, range = 3.5–28.2 s) in comparison with DL group (median = 8.4 s, range = 4.8–32.7 s) (P = 0.01); however, TPT and IT were comparable. POGO scores were significantly higher with GVL group than DL group (median = 93.8, range = 45–100 and median = 82.4, range 10–100, respectively) (P = 0.001). 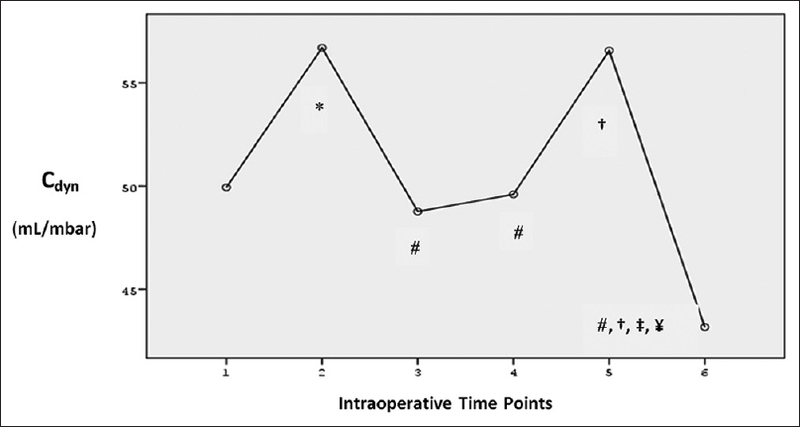 Overall success of intubation was the same; however, three patients in GVL group required a second attempt for intubation in comparison with five patients in DL group. One patient in DL group required a third attempt. Conclusion: In laterally positioned neonates, GVL is easier than DL with a similar intubation time, comparable time required for tube passage, better views of the glottis, shorter times to obtain the best glottic view, and high success rate as compared with DL. GlideScope seems to be an effective approach for endotracheal intubation of laterally positioned neonates with myelodysplasia. Aim: We aimed to investigate the changes in respiratory mechanics in adult patients undergoing open heart surgery (OHS) while using volume-controlled auto-flow (VCAF) ventilation mode. Materials and Methods: After obtaining ethics committee's approval and informed consent, 30 patients (17 males and 13 females; mean age: 57.3 ± 17.0 years; mean weight; 74.9 ± 13.6 kg) scheduled for OHS were enrolled. Mechanical ventilation was carried out using VCAF mode (VT: 5–8 mL/kg, I/E: 1/2, 10 ± 2 fr/min). Values of dynamic compliance (Cdyn) and resistance (R) were obtained at six time points (TPs). Normally distributed variables were analyzed with repeated measure of analysis of variance and Bonferroni tests. For abnormally distributed variables, Friedman variance analysis and Wilcoxon signed-rank tests were used. Values were expressed as mean ± standard deviation. P value <0.05 was considered significant. Results: Cdyn (mL/mbar) and R (mbar/L/s) values were as follows – (1) before sternotomy (S): 49.9 ± 17.1 and 7.8 ± 3.6; (2) after S: 56.7 ± 18.3 and 7.1 ± 3.7; (3) after S and after sternal retractor placement: 48.7 ± 16.1 and 8.3 ± 4.4; (4) after weaning from cardiopulmonary bypass and following decannulation while retractor was in place: 49.6 ± 16.5 and 8.1 ± 4.0; (5) after retractor removal: 56.5 ± 19.6 and 7.4 ± 3.7; and (6) after sternal closure: 43.1 ± 14.2 and 9.6 ± 9.1, respectively. Significant differences were observed in Cdynand R between; first and second TPs, second and third TPs, fourth and fifth TPs, and fifth and sixth TPs. Also, significant difference in Cdynwas found between first and sixth TPs, but it was not found in R. Conclusion: Cdyndecreases, but R remains the same in cardiac surgical patients when mechanical ventilation is performed with VCAF ventilation mode. Additionally, Cdynis negatively affected by the presence of sternal retractor and the sternal closure in OHS. Context: Elderly patients have a higher risk of complications and 30-day mortality than younger patients. Population is aging and this is an emergent preoccupation. Aims: The aim of this study was to evaluate the performance of Physiological and Operative Severity Score for the enumeration of Mortality and Morbidity (POSSUM) system on 30-day mortality in elderly patients submitted to elective surgery. Additionally, the correlation of WHODAS 2.0 and Clinical Frailty Score (CFS) with mortality was evaluated. Settings and Design: An observational prospective study was conducted between May and July 2017. Methods and Material: Patients submitted to elective orthopedic, gynecologic, urologic, vascular, plastic, and general surgery were included. Exclusion criteria were as follows: age <60 years old; inability to give informed consent; emergency/urgency surgery, inability to understand Portuguese; patients admitted in the ICU after surgery. POSSUM was used to estimate postoperative mortality risk. WHODAS 2.0 and CFS were used to assess quality of life and health status. 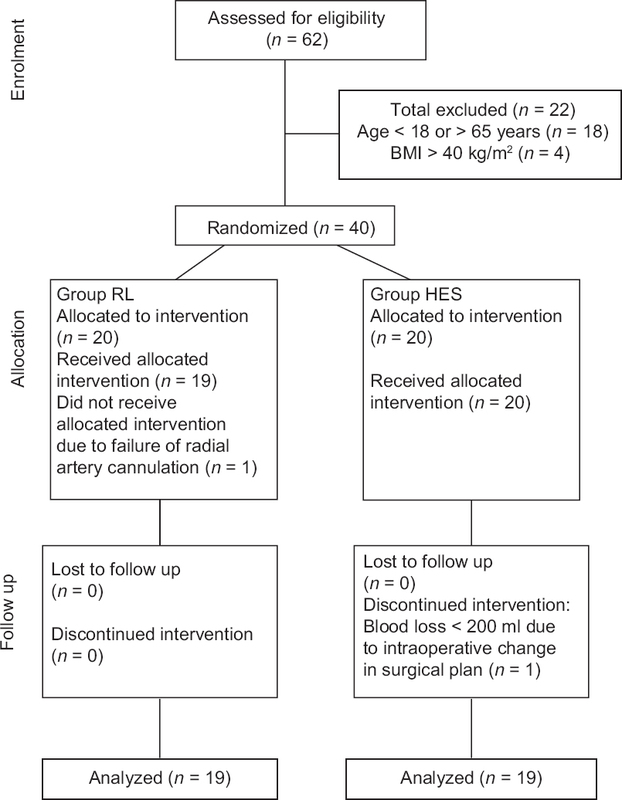 Mortality was evaluated during hospital stay and 30 days after surgery. area under the receiver operating characteristic (AUROC) was analyzed to test the discrimination of P-POSSUM, WHODAS 2.0 and CFS scale. Statistical Analysis Used: Statistical analysis was done using the SPSS Software (version 24.0). Results: POSSUM-predicted mortality was 3.0% with a standardized mortality ratio = 0.87; 95% CI 0.62–0.93; and a good calibration (H–L: P = 0.646); however, the AUROC was poor (0.563). We identified an association between mortality and a higher CFS grade (P = 0.000 and AUROC = 0.859) and a higher WHODAS 2.0 score (P = 0.000 and AUROC = 0.808). Conclusions: WHODAS and CFS appear to be a better assessment tolls for predicting postoperative mortality with a good discrimination comparing with P-POSSUM system. Background: The aim of this randomized controlled study is to compare the safety and efficacy of thoracic spinal versus thoracic epidural anesthesia for open nephrectomy in patients with obstructive/restrictive lung disease. Methods: Sixty patients with mild to moderate chronic obstructive/restrictive lung disease undergoing open nephrectomy were randomized into two groups, 30 patients each. 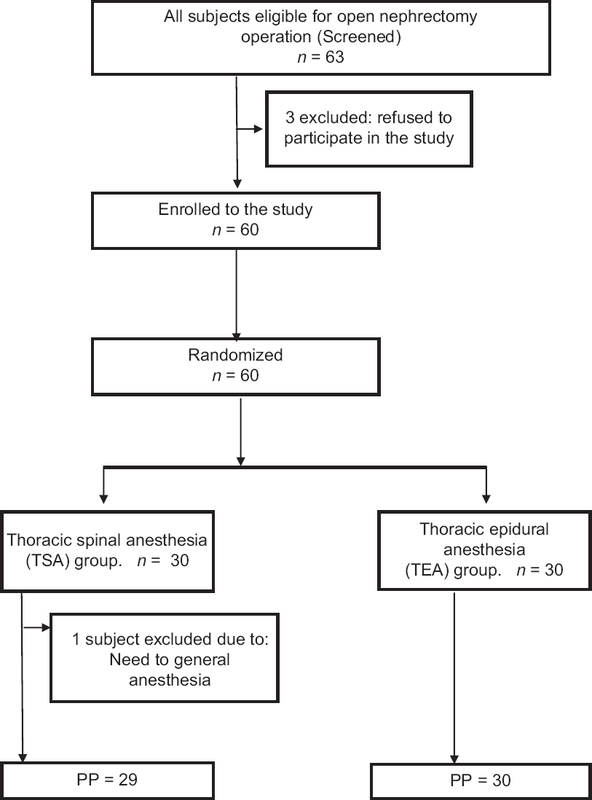 The thoracic spinal group (TSA) group received ultrasound guided mid-thoracic spinal anesthesia, and the thoracic epidural group (TEA) group received thoracic epidural anesthesia. All blocks were performed at the T7-T8. Hemodynamics, visual analogue scale score, sensory and motor block profile as well as any adverse events, and patient satisfaction were all reported. Results: Both blocks were successfully performed and were effective for surgery in all patients, with the exception of only one patient in TSA group who needed to receive general anesthesia even after IV midazolam because of extreme anxiety and was excluded from the study analysis. The sensory block ranges were quiet close, with T2-T5 for the TSA group and T3-T6 for the TEA group as the upper level and L3-L5 as the same lower level. The values for the onset time and the duration of sensory and motor blocks were lower in TSA group. There were no statistically significant differences existed in intraoperative VAS, and hemodynamics between the two groups. Postoperative adverse effects were negligible and insignificant, with no case reporting any neurological sequel. 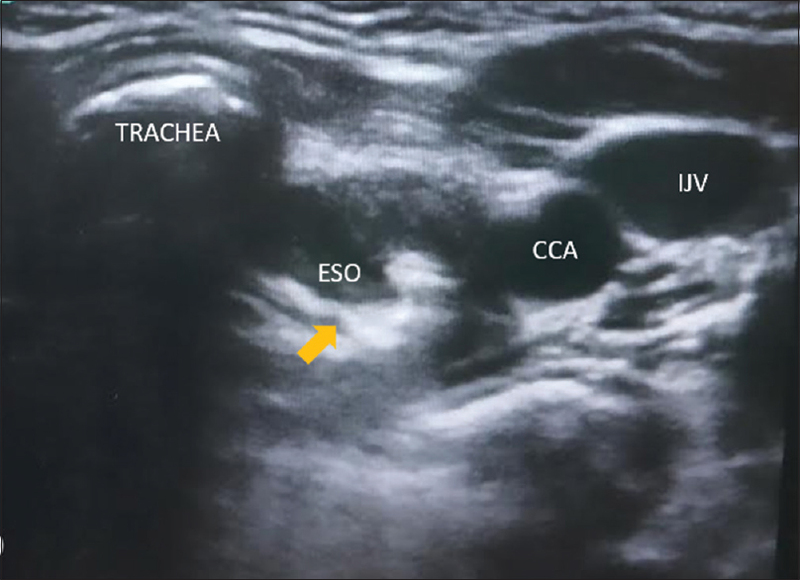 Conclusion: Ultrasound guided thoracic spinal anesthesia can be performed safely and effectively for open nephrectomy in patients with obstructive/restrictive lung disease with the potential for an early ambulation and great patient satisfaction. 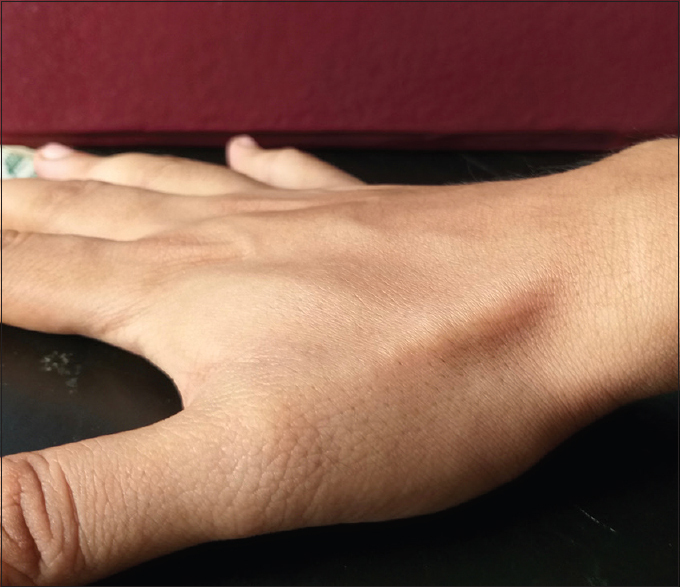 Purpose: Safety and feasibility of distal radial artery cannulation at the anatomic snuffbox in the perioperative settings in adult patients have been assessed in this study. 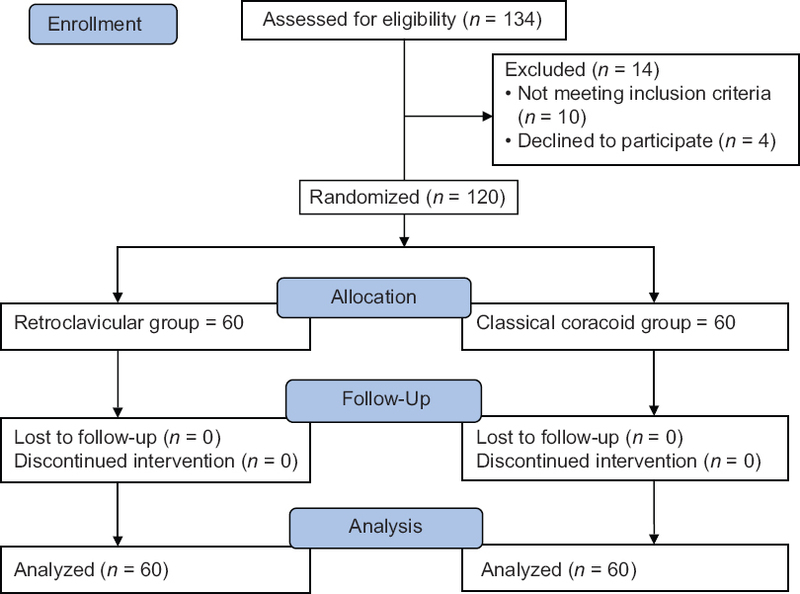 Methods: Adult patients undergoing elective surgery requiring arterial cannulation were recruited in this retrospective cohort study. Results: Data of 55 patients have been reviewed here; among which in 21 patients, arterial puncture was performed ultrasound guidance and in 34 patients puncture was guided by the pulsation of the distal radial artery at the anatomical snuffbox. First attempt success rate of distal radial arterial cannulation was 76.3% (42 of 55 patients) and it was similar between ultrasound guided (USG) and palpation technique (P = 0.53, Chi-square test). Overall, cannulation success rate was 87.3% (48 of 55 patients) and it was also similar between USG and palpation technique (P = 0.79, Chi-square test). Conclusion: Distal radial artery cannulation is technically feasible in patients undergoing elective surgery. 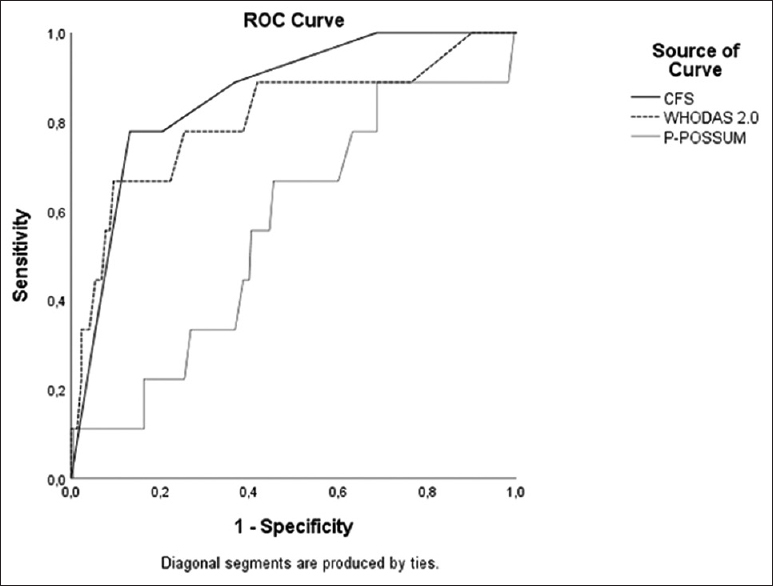 However, further randomized controlled trials are required to establish its clinical utility and safety profile in comparison to conventional radial artery cannulation. 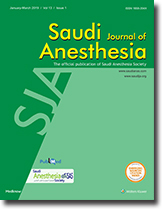 We report a case of intravenous ephedrine administration that abolished suspected bronchoconstriction during general anesthesia in a patient undergoing beta-adrenergic blocker therapy for hypertension and who was subsequently diagnosed postoperatively as having bronchial asthma. A 54-year-old man who had childhood asthma was scheduled for laparoscopic cholecystectomy at our institution. The preanesthetic interview suggested full resolution of his childhood asthma. 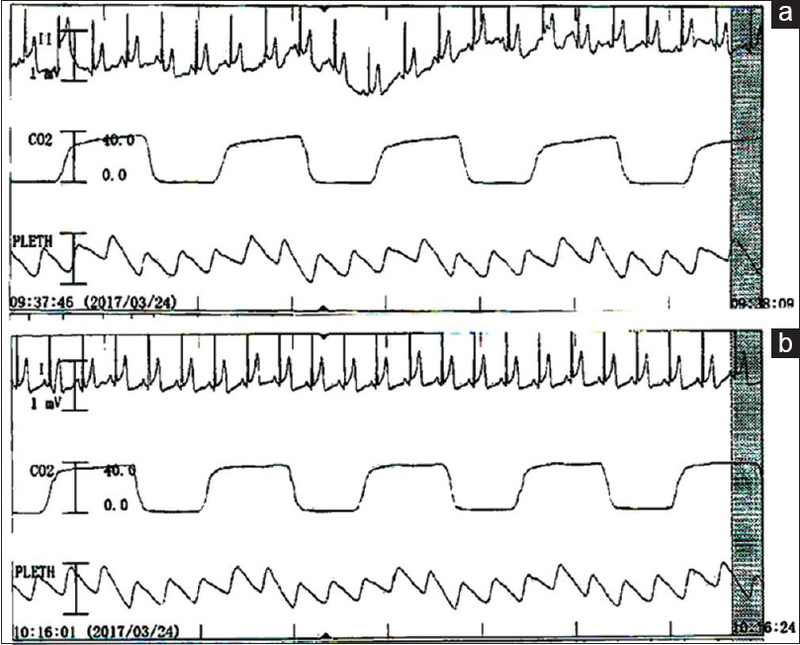 His capnogram showed an airway obstructive pattern immediately after the initiation of mechanical ventilation. However, after administration of ephedrine due to low blood pressure during surgery, his obstructive capnogram reverted to normal. On postoperative day 3, he was diagnosed as having bronchial asthma. Furthermore, we found that small airway obstruction as indicated in his preoperative pulmonary function test (PFT) had been overlooked. Two important points arise from this case. First, the use of beta-blockers for the treatment of hypertension in patients potentially having obstructive lung disease should be avoided. Second, clinicians should carefully check the preoperative PFT results in detail to ensure that nothing has been overlooked. 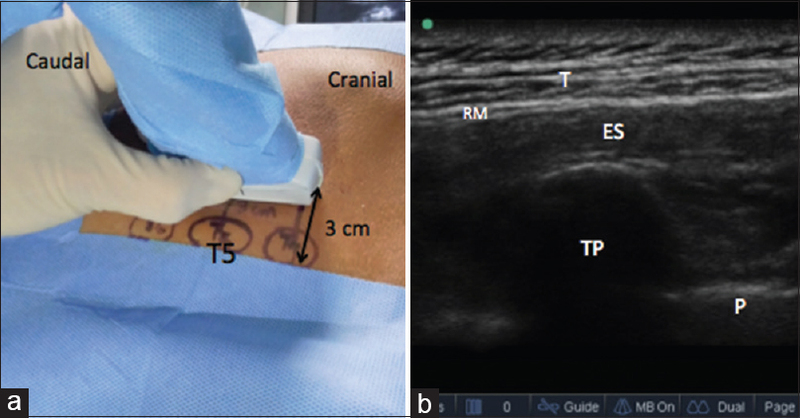 The erector spinae plane block (ESP) is a novel interfascial block described in 2016 by Forero. Although it has been used to provide analgesia for planned abdominal and thoracic surgery, it has never been used as a rescue technique for abdominal surgery. Pain control can be a challenge for anaesthesiologists in laparotomic surgery when epidural analgesia is contraindicated. We report two cases in which the ESP block has been successfully used as a rescue technique to provide pain relief after laparotomic surgery. Preoperative blood transfusion is sometimes controversial. 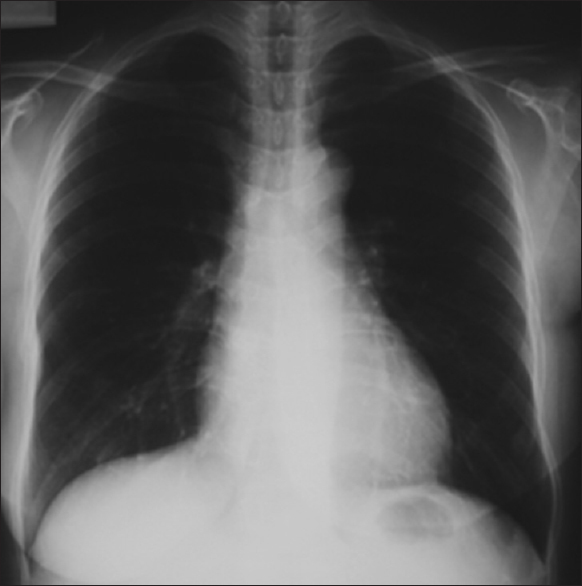 We describe a case of a 43-year-old woman who developed sudden pulmonary congestion during surgery despite a small amount of intravenous crystalloid administration. She had no allergic disorders. Preoperative examination revealed that her hemoglobin was 5.6 g/dl, and she was diagnosed as folate-deficiency anemia although she never felt any symptoms before. Therefore, blood transfusion was performed and her hemoglobin increased to 9.4 g/dl. Amid surgery, airway pressure increased suddenly and pulsed oxygen saturation dropped. Chest roentgenogram revealed that the lungs were congested and her heart was markedly enlarged indicating the state of circulatory overload. We suggest that preoperative transfusion in a patient with chronic anemia should be carefully considered, and strongly recommend the confirmation with chest roentgenogram. Postoperative pain after breast surgery is difficult to manage owing to its complex innervation. Recently, erector spinae plane (ESP) block, an interfacial block, has been described to provide pain relief after thoracic and abdominal surgeries, multiple rib fractures, and neuropathic thoracic pain. Local anesthetic injected in the erector spinae muscle sheath at the level of the 5th thoracic transverse process is distributed cranially and caudally along the sheath, and to the paravertebral space through apertures in the anterior sheath wall. This may block the dorsal and ventral rami of the thoracic spinal nerves at multiple vertebral levels and the rami communicantes transmitting autonomic fibers to and from the sympathetic ganglia, causing multidermatomal somatic and visceral analgesia. 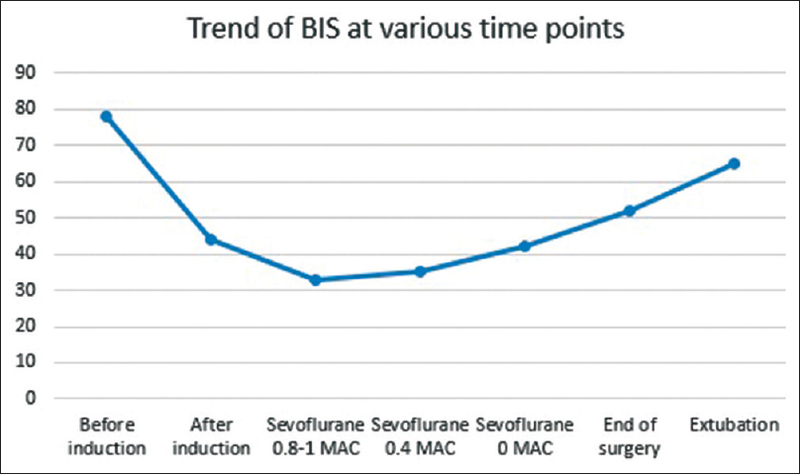 The present case report demonstrates the adequate perioperative analgesia provided by the ultrasound-guided ESP block in patients undergoing various breast surgeries. Cocoon abdomen is a rare condition in which abdominal structures are surrounded by thick encapsulating peritoneum resulting in dense adhesions. Liver transplant is a high risk surgery with an already increased risk of massive blood loss due to the pre-existing coagulopathy and portal hypertension. 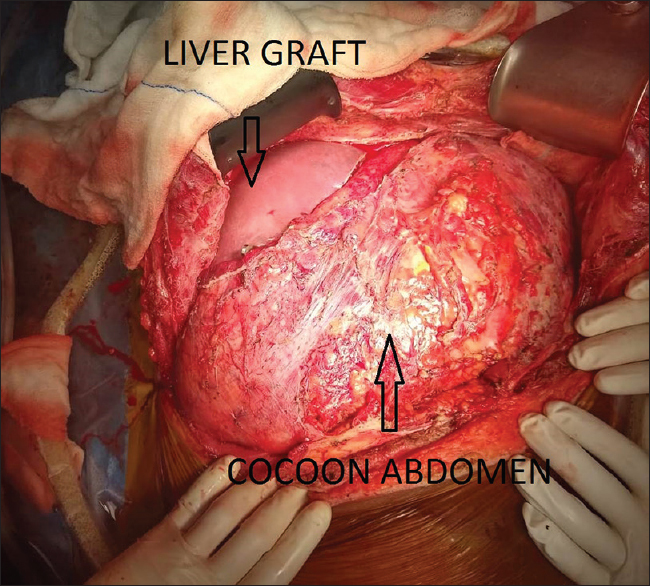 Presence of cocoon abdomen with severe dense adhesions can either lead to difficult hepatectomy with massive intra-operative blood loss or failure to proceed with the surgery. This becomes even more important in live donor liver transplantation where it may not be possible to abandon the surgery once the donor liver resection is started. Thus keeping a high suspicion of cocoon abdomen in patients with previous history of kochs abdomen and on long term beta blocker therapy is of utmost importance and this can decrease the morbidity and mortality associated with this condition. A 41 year old male known case of chronic liver disease was posted for live donor liver transplantation. After opening the abdomen thick dense adhesions were found around the intestines and the liver. Due to the dense adhesions surgical team was in dilemma whether to proceed further for the surgery or not. Intra-operatively patient had a blood loss of 12.5 litre. Despite massive transfusion the postoperative course went uneventful and the patient was extubated on 2nd post-operative day. He was shifted out of Intensive care unit on the 6th post-operative day. Cocoon abdomen should be suspected in a chronic liver disease patient with previous history of tuberculosis or on long term beta blocker therapy. Proper preparation before surgery can decrease the morbidity and mortality associated with this major surgery. Our case report clearly shows that such types of patients can be taken up for the live donor liver transplantation surgery with a precaution to start donor hepatectomy only after surgeon has assessed the difficulty status of recipient hepatectomy. Bronchial thermoplasty (BT) is an upcoming treatment for patients with asthma refractory to traditional pharmacotherapy. BT is an invasive procedure which carries a risk of coughing, wheezing, bronchospasm, and laryngospasm during and after the procedure. Some of these complications can be minimized using better anesthetic techniques during BT. We hereby report a case of a 63-year-old female with poorly controlled asthma posted for BT done under general anesthesia (GA) with supraglottic device. GA provides better working conditions for pulmonologists when compared with sedation. But still there is no consensus on what would be the ideal anesthetic technique for BT procedure. Till the time, considering anesthesiologist and pulmonologist's prospective, GA (total intravenous anesthesia) using supraglottic device would be a preferred choice for a safe and effective anesthetic strategy in BT.